Waterstone’s parent company HMV announced this morning that it would sell the UK book chain to Russian billionaire Alexander Mamut’s company, A&NN Capital Fund Management, for GBP 53 million. 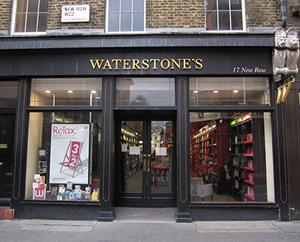 In a surprising move, The Bookseller reports that Waterstone’s current Managing Director Dominic Myers will be replaced by James Daunt to run the bookstore chain after the deal is completed. Myers will take on another role within HMV. Despite months-long rumors that the chain’s founder, Tim Waterstone, would be involved in the company after the sale, Daunt announced today that Waterstone will play no role in the future of the chain. In another report from The Bookseller, the response from the industry to this announcement appear to be positive across the board. Reactions from people across the British publishing and bookselling industries are enthusiastic and optimistic, both about the book chain’s future, as well as Daunt’s leadership and commitment to the bookselling business. HMV struggled to meet financial expectations this year, facing heavy competition from online and supermarket retailers of music, movies and books. HMV ends its fiscal year on April 30, which is when its lenders would officially asses their debt and overall finances. However, HMV negotiated earlier in the year to delay the evaluation of their debts until July 2, probably with the sale to Mamut in mind. If they can complete the deal with Mamut before their debts are assessed by the lenders, the company ends their year on better financial footing, which improves its status as a publicly traded company. The deal is contingent upon approval by HMV’s lenders, and according to a press release from HMV, the company expects its lenders to support the deal. The Wall Street Journal reports that the announcement of the sale boosted HMV shares by 10% at the opening of London trading this morning.